Circle Dock , is an intelligent dock that tracks your mouse and gets the dock right where your mouse pointer instead of you going to the dock that takes up your desktop space as with other dock application like RocketDock. As the name suggests, All the icons in the dock are arranged in a circular fashion.You can change background, icons, arrangement of the icons, labels, change the orientation of the icons,using the wheel button of your mouse to rotate the dock. Windows XP/Vista compatible. 32-bit & 64-bit compatible. Icon Replacement Mode to replace icons with using Drag and Drop. middle mouse button and the F1 key on your keyboard to toggle visibility. Rotate Dock using the mouse wheel. All the elements of the dock are resizeable and reorderable. 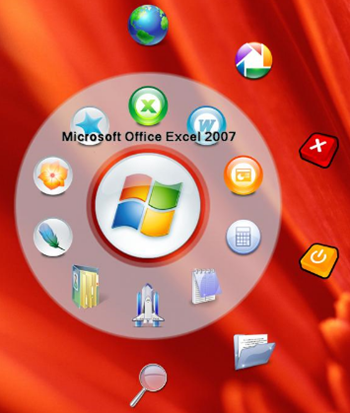 Circle Dock works with either Windows XP or Vista, both 32 bit and 64 bit systems are supported. .Net framework or higher is required.